Jonah tells the people of Nineveh that they must repent of their sin. URING THE YEARS that Elisha was the prophet in Israel, the Syrians were a strong nation, and they often warred against the Israelites. But after Elisha died the Syrian nation grew weaker, and by and by did not trouble Israel any more at all. Then a new enemy arose, from the far east country. This new enemy was the Assyrian king, who was conquering many little countries round about. And all the while he was sending his armies nearer and nearer to the border-land of Israel, and the Israelites were beginning to fear him. Nineveh was the capital city of Assyria, and the home of the great king. And Nineveh was a great city. It had stood for hundreds of years, and it had grown larger and larger until thousands and thousands of people lived inside its high walls. These people did not serve the true God, but worshiped idols. And year after year they became more wicked, until finally God thought he would destroy them all. But God is very merciful. He knew the people of Nineveh had not known about him as had the people of Israel, for no prophets had ever come to warn them about their wrong-doings. So he decided to send them a prophet from Israel to tell them that their city would be destroyed because of their awful sins. Jonah was the prophet whom God chose to send to Nineveh. But Jonah did not want to go to that wicked city so far from his homeland. He knew the Assyrians were enemies of the Israelites, and he thought it would be better if God would destroy their city than to give them a chance to repent of their sins. So Jonah thought, "I will not go to Nineveh. I will take a ship down at the Great sea, and I will sail away toward the west country instead of going toward the east country. Then maybe I can get so far away that God will not talk to me any more about going to preach to those wicked people of Nineveh." Jonah went down to the seaside and found a ship ready to sail away. He paid his fare, climbed on board the ship, and started with the sailors to go to a city called Tarshish, far to the west. He thought he was very safe now, and he feared no longer that he should have to go to Nineveh. Indeed, he felt so safe that he went down into the ship and soon fell fast asleep. But God knew all about Jonah's plans, and God was not willing for his prophet to disobey him. He had called Jonah to go to preach to the heathen people in Nineveh, and he sent a storm on the Sea which threatened to wreck the ship. The sailors became frightened and they called on their gods to quiet the winds; but the winds blew harder than ever. They did not know what to do. Finally the captain went down into the ship and found Jonah lying there asleep. The captain woke Jonah and told him to call upon his God for help in this time of trouble. But Jonah did not feel much like asking God to help him when he was running away from the work that God had told him to do. No doubt his conscience began to trouble him greatly; and when he saw the strong waves dash against the ship and toss it about like a chip on the water, he feared that he should never again see dry land. When the storm continued to rage, the sailors decided that one of them on board the ship must be the cause of the trouble, so they decided to cast lots and see on which one the lot would fall. And the lot fell on Jonah. Jonah was a stranger among them, and the sailors wondered what terrible thing this stranger had done. They gather round him and asked, "Tell us, who are you and what is your business?" And Jonah told them that he was from the land of Israel and that he worshiped the God who had made the sea and the dry land. At once they were afraid, for they did not know about such a great God, and they thought surely he was angry. Jonah told them how he had tried to run away from God, and they believed that God was trying to punish him. Jonah, too, believed that God had sent the storm on his account. "What shall we do to you that the storm may cease?" asked the frightened men when they saw that their ship would soon be dashed in pieces if the wind and waves continued to toss it about. And Jonah answered,, "Throw me overboard in the water, and then the storm will end." The sailors did not wish to treat Jonah so cruelly, but when they saw that all would be lost if they allowed him to remain on board the vessel, they picked him up and threw him into the sea. But God was not yet finished with Jonah. He had prepared a great fish, and the fish swallowed Jonah and carried him about for three days and three nights before throwing him out onto the land. 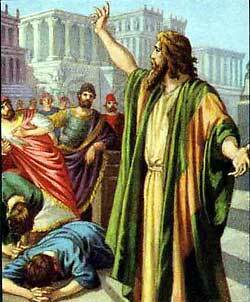 By that time Jonah was very willing to go to Nineveh and preach God's message to the people there. When Jonah entered the city he began to cry out: "Within forty days Nineveh shall be destroyed!" On and on he went, for Nineveh was a great city, and in every street where he passed he cried out the same words. And the people stopped to listen to his strange message. They had never see a prophet of God before. Some of them ran to tell their King about Jonah's words, and the King was frightened. He rose from his throne and laid aside his rich garments and dressed himself in sackcloth. Then he sat down in ashes and became sorry for his sins. He commanded all the people of the city to do as he was doing, and to cry earnestly to God to spare their lives. After Jonah finished preaching he went outside the great walls and waited to see the fire fall from the sky to burn up the enemies of the Israelites. But forty days passed by and no fire fell. Because the people believed Jonah's message and repented of their sins God did not destroy their city. Then Jonah became very much displeased. He feared that people might call him a false prophet, and he wanted to die instead of go back to his own county again. God taught Jonah a lesson by allowing a gourd-vine to grow up in one night and make a shelter for him from the burning heat of the sun. Then God caused a worm to destroy the gourd, and Jonah became very unhappy. Again he wished that he might die. So the Lord spoke to Jonah and said, "You were sorry to see the plant die, though you did not make it grow. And should I not have more pity on the people of Nineveh than you have on a plant?" Jonah learned that God looks upon people of every nation as being precious in his sight, even though they do not know how to worship him.